Summary: In this chapter from Teaching the Neglected R, Lisa Miller links the process of digital storytelling to the processes of prewriting research, exploration, and revision, and also explores nuts-and-bolts aspects of story creation. 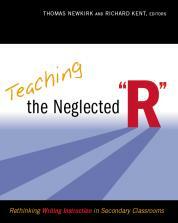 Teaching the Neglected "R" Heinemann, 2007, 296 pages. When we take our students through the writing process to create a report or essay, they practice the different types of thinking and preparing and revising that go into a strong piece of writing. They learn that great writing doesn't appear by magic and that they can get better at writing. They learn the power of their own experiences and voices. With digital storytelling, words and the writing process matter as much as ever. We still must take students through that process, from coming up with an idea to collecting information to focusing and organizing to drafting to revising. The process isn't a completely different animal when applied to digital storytelling." Copyright © 2007 by Heinemann. Posted with permission. Miller, Lisa C. 2007. "Space to Imagine." Chap. 15 in Teaching the Neglected R . Portsmouth, NH: Heinemann. About the Author Lisa Miller is an associate professor at the University of New Hampshire, where she teaches journalism and digital storytelling. Download "Space to Imagine Digital Storytelling"